This is a beautiful vintage musical jewellery box, made in Sorrento, Italy. It dates to the 1950s/60s and is complete with its original working lock and key. 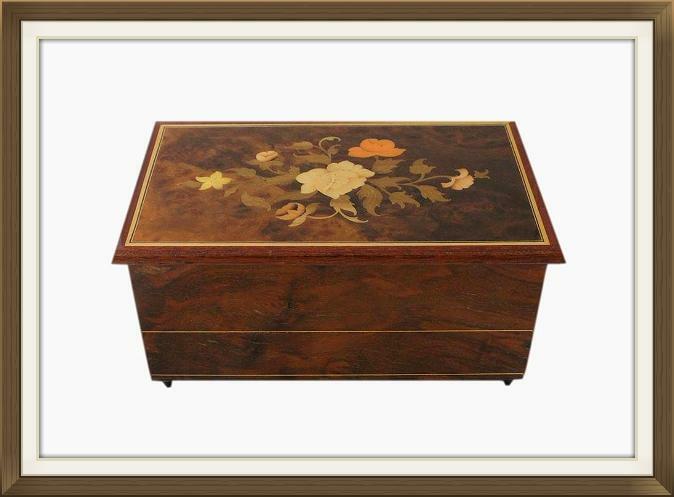 The lid has a beautiful Burr Walnut veneer, and is inlaid with pretty flowers and leaves. 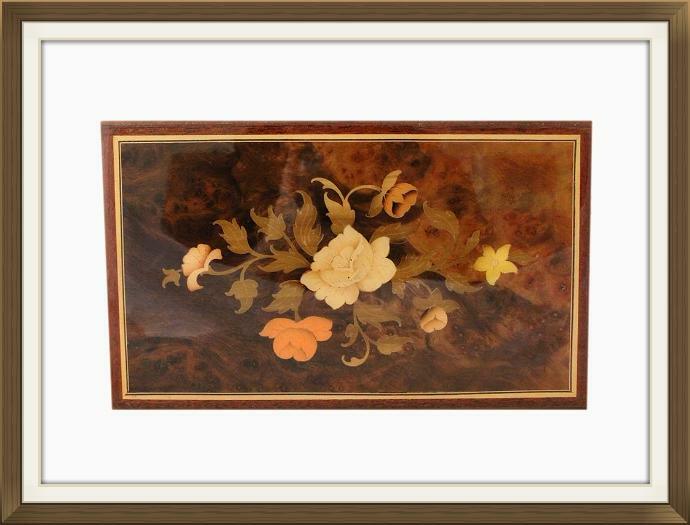 It has a lovely inlaid Satinwood border with inlaid Satinwood stringing, and all of this is surrounded by a beautiful Mahogany frame. The floral inlay is made up from several varieties of wood. Some of the inlaid flowers have been stained, giving them a beautiful splash of colour! 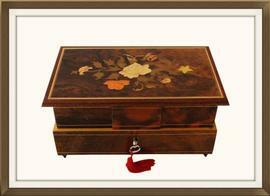 The body of the box has a Walnut veneer (not Burr) and Satinwood stringing on all four sides. 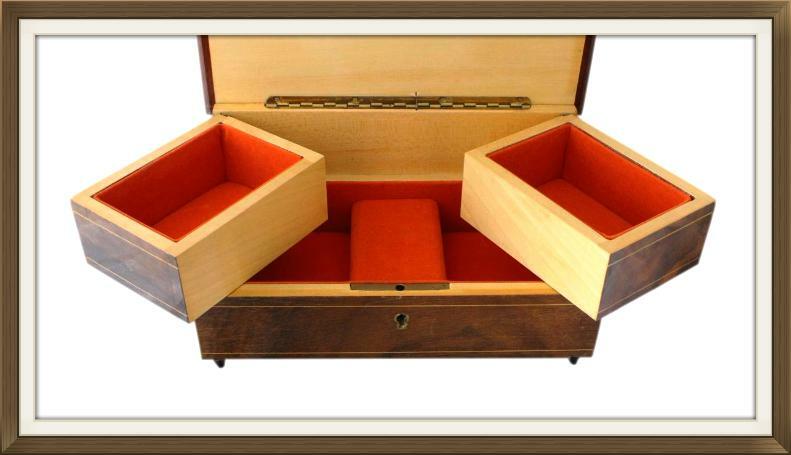 The box is made of Satinwood, as can be seen in the interior and on the bottom. The box is complete with its original working lock and key. 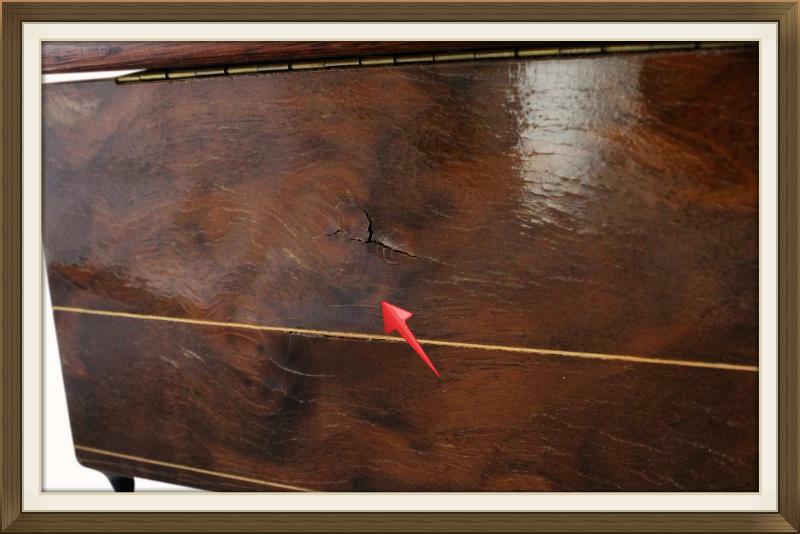 It is also complete with its original long piano 'stop' hinge which prevents the lid from falling back. It stands raised on its original tapered and ebonised feet. The bottom of the box has retained its original musical movements label. Details of the movement are given below. All of the exterior has a glossy lacquered finish. Please see below for further important information on vintage locks. The top of the interior has two swing opening compartments, and there are two further compartments beneath these. The musical movement is beautifully concealed between the two lower compartments, and there is space upon this for further jewellery storage. All of the compartments and the casing to the movement, have their original soft felt linings/coverings. These are a beautiful warm orange colour. The panels in the bottom of each compartment are thickly padded. The compartments also have their original hinges. The Satinwood to the interior has a glossy lacquered finish. 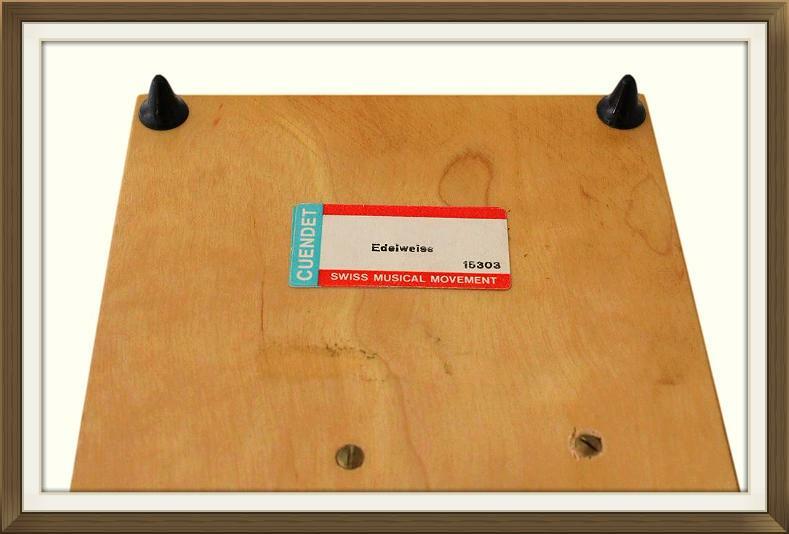 This box has a quality Swiss CUENDET musical movement. It plays the beautiful 'Edelweiss' tune from the 1959 Rodgers & Hammerstein musical, 'The Sound of Music'. The movement is operated via the winding key on the bottom of the box. 5 turns of the key are sufficient to wind up the movement. The music stops as it should, when the lid is closed, or when the movement is fully unwound. Please see below for further important information on musical movements. 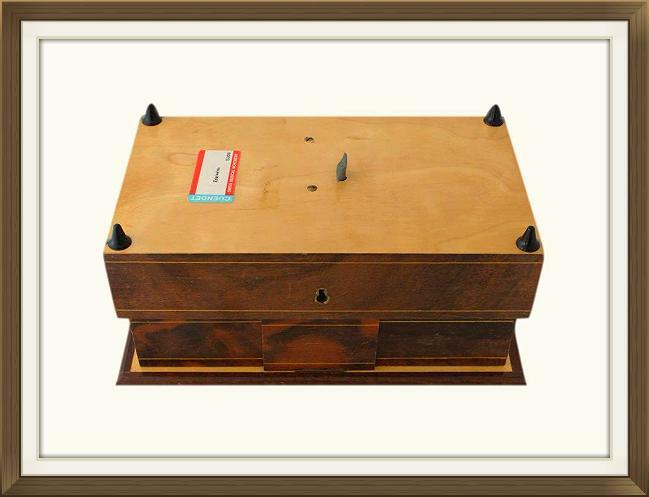 This wonderful box is in excellent condition for its 50-60 years of age. All of the inlay is present and intact, and the box is structurally sound. The interior felt is in excellent condition with no splits, fraying or stains. The compartments are so nice that they appear to have seldom been used, if at all. There is minor rippling to the lacquered finish on the exterior main body of the box. This does not detract from the beautiful overall appearance of the box. 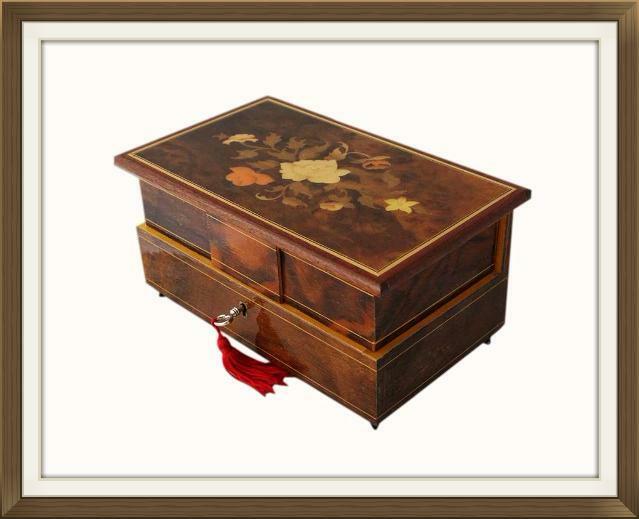 The lid is beautifully smooth to the touch and so too is the Satinwood interior. There is a small area of veneer on the back of the box which has split/lifted. Please see image 9. 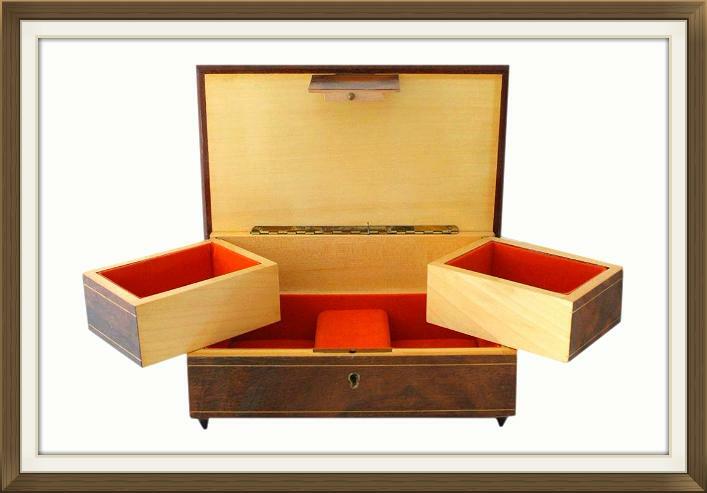 The box locks securely with its key and the musical movement is in perfect working order. Each 9.5 by 6.5cm with a 4.0cm depth. Each 10.0 by 7.5cm with a 4.3cm depth. 10.0 by 5.7cm with a 1.5cm depth. This box will be posted FREE within the UK, by Next Day Special Delivery. International postage is by Royal Mail International Tracked Post. Delivery is fast, within 3-5 working days to Europe and 5-7 working days to the rest of the world.